Art the Science is proud to announce the completion of its inaugural immersive science-art residency featuring artist/creative coder Owen Fernley and environmental engineer/associate professor Dr. Kevin Mumford (Department of Civil Engineering at Queen’s University). The residency culminated in the creation of a research-inspired artwork titled Between the Sand. From March 19-29, 2018, Dr. Kevin Mumford’s environmental engineering research laboratory at Queen’s University hosted creative coder Owen Fernley for their first science-artist residency, facilitated by Art the Science. Mumford’s research group looks at how hazardous chemicals move in the natural environment and how they can be remediated. Fernley was immersed in the research process, from observing experiments to working alongside graduate students. The result was Between the Sand, an algorithm-based artwork that fuses his residency experience with his artistic practice. 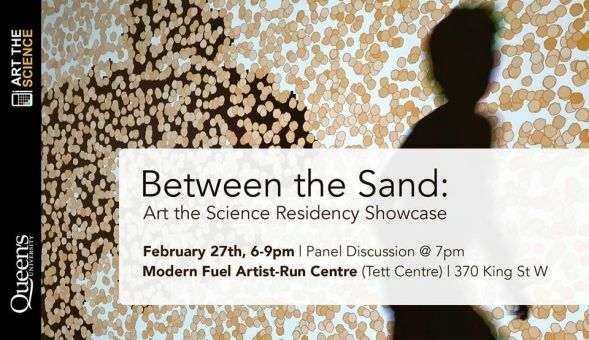 Art the Science founder Julia Krolik will moderate the panel discussion and explore the process behind the residency. Discover the value of the artist-scientist collaboration, the lessons learned from this experience, and what’s in store for future residencies. Art the Science is a Canadian not-for-profit organization committed to celebrating the connections between art and science. Art the Science facilitates cross-disciplinary relationships between artists and scientists with a goal of fostering Canadian science-art culture.